The popular owner-entrepreneur of Callie’s Biscuits reveals her modern approach to traditional Southern cooking, sharing charming stories and fabulous, accessible recipes in a Southern-style Make the Bread, Buy the Butter. Carrie Morey started her company, Callie’s Charleston Biscuits, with a simple goal: She wanted to make her mother Callie’s delicious biscuits—unbelievably tender, buttery creations—accessible across the country. Carrie’s handmade biscuits combine unique, brilliant flavors—sharp cheddar with fresh chives, cracked black pepper with cream cheese and green onions, and cinnamon biscuits so buttery they melt in your mouth. The biscuits are an iconic Southern staple, but they are just the beginning. Now Carrie Morey shares her modern approach to traditional Southern cooking in more than one hundred recipes that pair classic Lowcountry fare with surprising twists, for incredible results. Carrie guides you through the foundational techniques of Southern cooking to reveal how she developed her new takes on favorite heritage dishes and how to take the fuss and huge time investment out of traditional preparations. She shares skillet recipes passed down through generations, including Lemon Zest Cast-Iron Fried Shrimp, Macaroni Pie, and Cast-Iron Herb Lamb Chops. She gives roasting and slow-cooking techniques for Beef Stew with Herbed Sour Cream, Spicy Black-Eyed Pea Salad, and Roasted Pimento Cheese Chicken. Her DILLicious Cucumber Sandwiches, BBQ Chicken Salad Biscuits, Fiery Pimento Cheese Deviled Eggs, and Summer Crab Salad will make any picnic or casual get-together a true Southern affair. And her desserts are to die for: Mama’s Sour Cream Banana Pudding, Alex’s Chocolate Chess Pie (so good that Carrie credits the pie for sparking her and her husband’s whirlwind romance), and Blueberry and Peach Cobbler finish your meal on the perfect sweet note. Carrie also shares her family stories behind each recipe—growing up in Charleston, learning to cook from great Southern matriarchs, and founding and growing her business. Fill your kitchen with the comforting aroma of home-cooked goodness with Callie’s Biscuits and Southern Traditions. 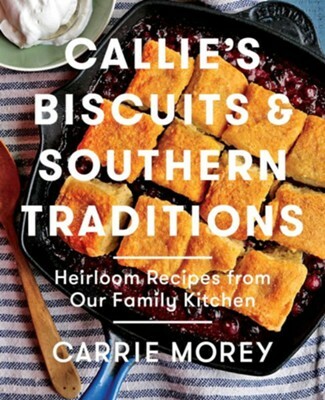 Carrie Morey, daughter of Callie White, founded Callie’s Charleston Biscuits in 2005 with the goal of making her mother’s delicious biscuits accessible across the country. Touted by the Today show, Saveur, Food & Wine, Southern Living, The New York Times, and Oprah, her biscuits and pimento cheese collection are sold at high-end retail stores all over the country. Chosen as one of Martha Stewart’s “Dreamers into Doers” in 2008, Carrie has been a guest lecturer on entrepreneurship at the College of Charleston School of Business for more than five years. “Opening the oven on culinary secrets…full of charming asides, cooking tips, and always a story… A lifetime of dishes that have been the binding agent of one family, now shared with others." I'm the author/artist and I want to review Callie's Biscuits and Southern Traditions: Heirloom Recipes from Our Family Kitchen - eBook.